The college has well-established connections with a number of schools from different parts of the world. Trips to Uganda have been a regular part of the school calendar since 2010, and run as a joint project between geography departments from South Molton, Braunton and Pllton schools, working in collaboration with the locally based ‘Amigos’ charity. Amigos is building a reputation for its innovative and successful work in supporting under-privileged youngsters in Uganda. The charity focuses on two key projects, the first being Kira Farm Training Centre, which provides a holistic and vocational education to around thirty disadvantaged youths aged 17-28 years. Secondly, it has a child sponsorship programme which supports deprived children through primary and secondary education. It currently provides school fees for around 300 children. Young adults selected to attend Kira arrive with harrowing tales of poverty, conflict and suppression. Some have previously been forced into becoming child soldiers and ordered to carry out horrendous acts, many against their own family and friends. Others have been rescued from child sacrifice, or have lost parents to the AIDS virus. Over a year long course, their personal and academic development is supported by dedicated staff, and they are trained in core subjects such as sustainable agriculture, tailoring, carpentry, catering and mechanics. Amigos hopes that by training these young people they can bring positive change to a generation that has known only conflict, loss and heartache. Students from South Molton and Braunton schools usually visit Uganda in July, and an additional trip involving students from Pilton school runs in October. All students work really hard to raise £1700 each in sponsorship to fund their flights, accommodation and a contribution to the running and development of the work of the Amigos charity. Many students make an extra effort to raise funds beyond their target figure. To raise money, students organise music concerts and discos, dinner dances, horse riding weekends, take part in sponsored events such as cycle rides, abseils etc., make cakes and jams, and run quiz nights and other such events. Accommodation for the trip is provided in a new purpose-built guest house at Kira Farm, and trip members have plenty of opportunities to mix with the Kira students and involve themselves in the day to day chores of running the farm, such as tending to the farm’s livestock (cows, goats and chickens), harvesting maize, planting trees, and weeding. As well as this, they also take part in lessons on tailoring, catering and hairdressing. Each trip tries to have a special focus connected to a sustainable aid project. During the 2012 trip, English students were able to spend time working with Kira students constructing bio-sand water filters. This was a labour-intensive operation, that required the manufacture of a concrete case in a metal mould, which could then be painted. Once finished, these were then taken to selected sites in the local area, where they were installed and filled with layers of different grades of sands and gravels that had been thoroughly washed beforehand. Within three days, ‘dirty’ water from the local supply – usually a community pump or nearby stream – could be converted into a clean and safe water supply for local families to enjoy. The wider use of a clean water supply that minimises water-borne diseases inevitably helps to improve health, particularly amongst young children. Sites were carefully chosen to maximise impact, and included local sports clubs, local schools, and homes of influential individuals such as village councillors. 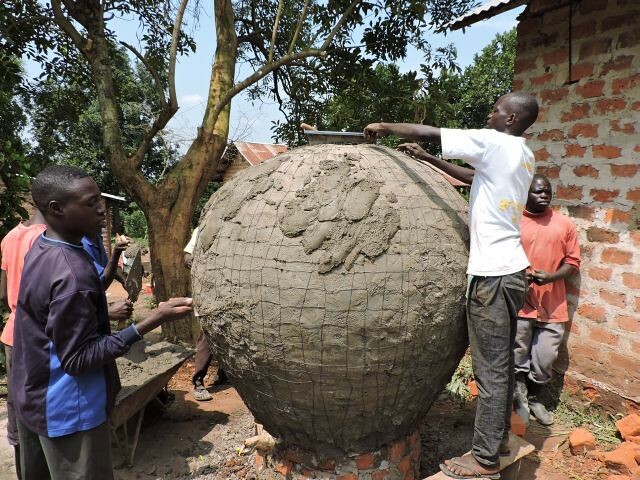 In 2014, we continued working on this exciting project theme by helping local people make giant water storage containers to provide them with a constant water supply throughout the year. This was another labour-intensive operation that required the building of a brick shell which was then rendered with two layers of cement. The bricks were then removed from the inside leaving a large water storage vessel that would in just a few days be quickly filled by rain water running off of corrugated iron roofs. The finished water jars have a capacity to hold 2000 litres of water, which is then easily accessible to a number of homes – changing the lives of perhaps 30 people. South Molton Rotary Club made a generous £500 donation to work carried out on the 2014 trip, and this was used to fund two of the water jars completed by the team of Ugandan and English students. As a sister project to the water filters, Kira has also championed the manufacture and installation of ‘tippy taps’ both at the farm and within the local community. These are simple wooden structures that provide a quick hand-washing facility to help improve health and hygiene. In 2016, we hope to get involved with some other sustainable technology projects at Kira. Experiments are already being carried out to test the efficiency of ‘eco-stoves’, which help reduce charcoal use and save time. Solar lighting projects are also in development, where a single solar panel can power lights for use in a Ugandan home. This eliminates the potential danger of commonly used kerosene lamps which bring with them a real risk of fire, especially in thatched mud-walled huts which are common in rural areas. In the middle of the trip, the group is able to travel north to the Masindi area where we are welcomed with a party feast attended by the whole of the local community, and comprising of a mix of formal speeches, music, dancing, and locally produced food. While in Masindi, the group has the chance to visit the homes of past pupils from Kira, and also some of the schools attended by children who are part of the Amigos sponsorship programme. It is genuinely uplifting to see how some young adults have made a real success of their lives, putting to use the valuable skills they had picked up at the training centre. On the last trip, two members of our group, Elsbeth Beard form South Molton School, and Noah Milton from Braunton School were excited to meet up with children they personally sponsor. We visited Noah’s new friend in his school, and it was a real privilege to visit the home of Elsbeth’s sponsored student, Juliet – a delightfully shy young girl working hard to realize her ambition to become a doctor. At local schools, we are able to chat to dedicated teachers and highly-motivated students who display a real passion for learning in a very challenging environment. We get to see large classes working incredibly hard in classrooms that are bare and missing the usual facilities we have come to take for granted in English schools. Our students can grasp the chance to take some mini-lessons themselves, as well as playing volleyball and football with the Ugandan pupils. While travelling further north in the country, we are also able to enjoy a game drive in the Murchison Falls National Park and a morning river cruise on the White Nile. Good views can be enjoyed of Murchison Falls as well as exotic game such as hippos, crocodiles, elephants, giraffe, warthogs, hartebeeste and waterbuck, and birdlife including goliath heron, African darter, crowned crane, and red-throated bee-eaters. Students on this trip have a unique opportunity to see for themselves some of the great injustices that exists in other parts of the world, as well as take an active part in some intermediate technology projects. On their return, they have a choice of adopting one of three stances – indifference (where they quickly forget about what they have seen and go back to their normal way of life); passive (where they spread the word about the work of the Amigos charity, and what they have experienced); or active (where they continue to fund raise for future projects, and maybe even visit Uganda again). For many of them, it is a life-changing experience, and will serve to shape some of their future views on the geography of Africa, and the inequalities that exist across the world. February 2016. Head of Geography Gareth Godwin and teacher representatives from 3 local secondary schools have just returned from a successful visit to partner schools in Kathmandu, Nepal. Gareth, along with Nick Langmead (Braunton Academy), John Davies (Pilton Community College) and Josephine Hockin (Bideford College) spent a week in Nepal visiting partner schools they have under the British Council’s Connecting Classrooms initiative. The schools were successful in submitting a bid that focuses upon building global awareness and cross-cultural learning in each country amongst both staff and students. South Molton Community College is partnered with the Reliance International Academy in Kathmandu and the visit was a follow up to the visit of 5 Nepalese teachers to the College in September 2015. Following the excellent sessions provided for our students by the Nepalese teachers the return visit allowed the teachers to take out work from our students about what their home towns, schools and local communities meant to them. As well as allowing the Nepalese students to learn about students in the UK it also allowed North Devon students the opportunity to enquire about what life is like in another part of the world. In addition to this the visit allowed the teachers the opportunity to discuss and observe the teaching pedagogy in Nepalese schools and deliver short lessons in each of the partner schools. Each of the Devon schools does a great deal of international work educating our students about the similarities and differences of communities and countries. Participation in this British Council project has enabled a large number of students, staff and the wider school communities to gain a real insight into the lives and work of adults and children in Nepal. To see houses and schools razed to the ground by the earthquake, yet continue to provide an education albeit in temporary classrooms was something that will remain with us all for a long time, as will the desire and interest in their education that the students of Nepal had and how important they see education is to them for future development of their country. The visit was hugely successful and in spite of the hardships suffered as a result of the 2015 earthquake that hit Kathmandu, the Nepalese hosts provided the warmest of welcomes. What has been brought back to our schools to share with both pupils and staff will be engaging and valuable as we seek to widen the experiences we all try to provide. The next phase of the project is to develop further sharing of resources and information between each of the schools with a view to returning to Nepal in the future. In 2015, year eight students made contact with the Reliance International Academy in Kathmandu as part of a ‘Connecting Classrooms’ project organised by the British Council. After a number of Skype video calls, students from both schools have been communicating with each other on a regular basis – exchanging personal letters and information about their own school and country. The terrible earthquake disaster in April of 2015 did affect the Reliance Academy, but thankfully, the situation in Kathmandu has begun to return to normal and the schools have been able to resume their correspondence. Students from South Molton have since organised special events to raise funds towards the Nepal Earthquake Aid Appeal. In November 2014, the Head of Geography joined a British Council ‘Connecting Classrooms’ project to visit schools in Mar Del Plata, a large beach resort to the south of Buenos Aires. In the spring of 2015, three Argentinian teachers made the reciprocal visit to South Molton, and this exchange has helped forge an on-going link between schools from the two countries. Students have used a dedicated ‘You Tube’ channel and specially created web site to share letters and projects covering different aspects of their home nations. Students from year 7 drinking traditional Argentinian mate – brought over by the visiting teachers. South Molton Community College has been selected to become one of three UK partner schools in a technology based project connecting students from this country with students from Ecuador. Neil Emery from ‘Trilby UK’ has masterminded this venture, and has visited village schools in Ecuador using I Pads to support his teaching about water quality in local rivers. He made contact with students from the UK schools via Skype video calls before returning to this country to work with them on the same chosen theme. A group of mixed-age geography students from South Molton Community College visited Exmoor with Neil (and a National Park Ranger) to examine water quality in the river Lyn. The results from their findings have since been crafted into a number of chapters of an e-book which will eventually also include work from the other participating schools. To support the project, Pasco Scientific Instruments Ltd donated around £700 of I Pad compatible measuring equipment to collect data about water pH (acidity), water temperature, and dissolved oxygen. The final version of the e-book will be later published on the Apple I Tunes store, and be available for download – with all proceeds going to support a similar project next year. Students Laura Radley and Tom Wilkinson working with Neil Emery from Trilby to measure water quality on the river Lyn.